Easter is on its way and here are easter egg brads and/or charms for your papercrafting embellishments. 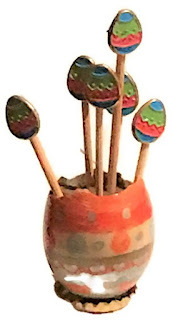 Each brad measures about 13mm and if you are a handmade card maker and/or scrapbooking fan, any of these easter egg brads will look great on your Easter card projects and/or easter-themed scrapbook page. Five(5) easter egg brads for $3.75. Check it out now. Click here or click on the image above.